The Xylosynth™designed by a team headed by William Wernick and manufactured by Wernick Ltd in the UK is the world’s foremost MIDI mallet percussion controller with a natural playing surface. The new Mk7 Xylosynth has been several years in development and we are both proud and excited by the superior sensitivity and dynamics. The new programming capabilities give outstanding control and the new USB connectivity opens up a whole world of possibilities. The solid hardwood or laminated birch bars make the Xylosynth™ stand out in the field of electronic percussion. There are 2, 3, 4 and 5 octave models available in ‘Standard’ and ‘Special’ versions. The 4 and 5 Octave models fold in half for portability and with the new USB power you can set up virtually anywhere. Our revolutionary sensing and filtering technology enables the Xylosynth™ to bring out the best in your playing. With a vast dynamic range, lightning fast response and triggering time, what you play is exactly what you hear. The Xylosynth™ will make you forget that you are playing an electronic instrument, allowing natural glissandos and true expression. Each instrument is custom made with exceptional build quality allowing us to give a 2 years parts and labour guarantee INCLUDING bars if using soft marimba mallets. Take the option of Internal Sounds with no programming required or just use the ‘MIDI out’ to access unlimited sounds from any MIDI device or the new USB POWER AND COMMUNICATION. We are a 90% export company well versed in dealing with customers all over the world so wherever you are you can order from us with confidence. 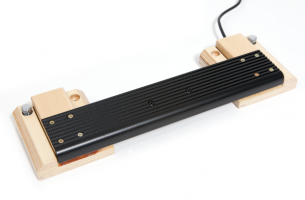 This STUNNING instrument should excite Marimba, Vibraphone and Xylophone players of all standards who are looking for the convenience and flexibility of an electronic instrument. We want to make everyone feel good when playing our musical instruments, whatever skill they may possess, which is why we made the Xylosynth™ beautiful to look at, easy to play and natural to the touch. Although we produce an electronic percussion instrument we have tried to keep the components of the acoustic equivalent that are important to the player, the playing surface and the uncomplicated set up. We have evolved our instruments with help from many sources and continue to come up with inventive solutions if asked. The player should find it easy to switch between their acoustic equipment and the Xylosynth™ when the need arises or the Muse takes over! We do not believe in the ‘throw away’ culture. All our products are serviceable. We believe in gaining and keeping the trust of players by guiding them personally through the buying process and then offering an excellent after-sales service.